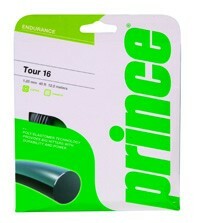 The Prince Tour gives the power baseline player exactly what they want, a control string that allows them to swing away as much as they want. The Prince Tour gives the power baseline player exactly what they want, a control string that allows them to swing away as much as they want. This extruded monofilament string provides a low powered response with plenty of access to spin. Exceptional amount of control, letting the player swing aggressively and letting the spin keep the ball in the court.